I was wondering if anyone has information on the life of Eddie Woods? I have an old Camel advertisement with him as the "poster boy" in 1933. Marty Wood, Pendleton, Oregon, is known for his colorful style, incredible balance and ability to anticipate a horse’s next move – skills developed riding the jumping horses trained by his father. 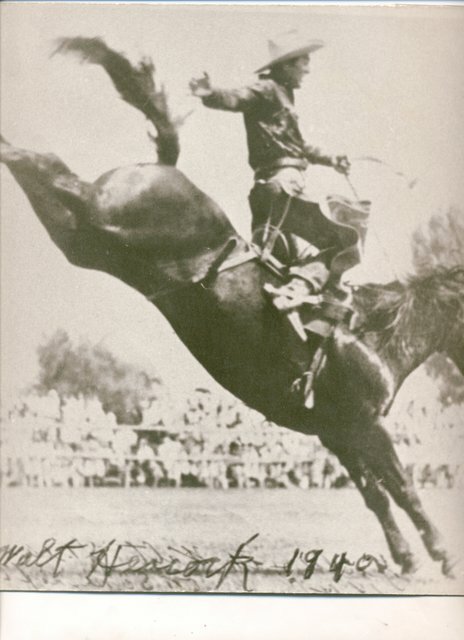 During his career, Wood won three world champion saddle bronc titles in 1958, 1964 and 1966, qualified for the NFR 14 times, was named RCA saddle bronc runner-up four times and won the Canadian saddle bronc championship three times. Wood is the son of a horse trainer and former bronc rider and his first love was baseball. However, an early shoulder injury put a career in baseball out of reach. At age 20, he turned professional and hit the rodeo trail, competing in saddle bronc riding and winning at every major rodeo in the United States and Canada. Wood was a 1991 ProRodeo Hall of Fame inductee and has been inducted into the Calgary Stampede Hall of Fame, Ellensburg Rodeo Hall of Fame and the Alberta Sports Hall of Fame. Hay Feeder, there is a Casey Tibbs memorial group/museum, or something at Ft. Pierre, SD. Also should be quite a few families in that area, on out at least to the Eagle Butte area, who have someone who remembers Casey and knows more about him than is posted here. There is a good tourist facility/museum called "1880 Town" at exit 170 on I-90 in the middle of western SD where there is a lot of Casey Tibbs memorabilia. It was collected by the elderly owner, a fan of Casey. There also is a video of the old movie, "Born To Buck" Casey made years ago, about buckinghorses, still available in the area. Not great qualiy video, but enjoyable, anyway. I'm betting there must be more of TxTibbs' relatives who were older than he who recall more about Casey, still living in the Ft. Pierre area, and if you are seriously interested they would be in the phone book for that area. Good people, too! looking for photos and information on Cadillac Jack Favor, one of the founding members of Cowboys Turtle Association. Need photos and history, am trying to get him inducted and need all I can get. Contact Marsha Lindsey, Museum Director at (225) 655-2592 at the Angola Prison Museum. Maybe she can help you. the_jersey_lilly_2000 wrote: Contact Marsha Lindsey, Museum Director at (225) 655-2592 at the Angola Prison Museum. Maybe she can help you. Did members of the CTA have numbers associated with membership. For example, Gold Card #486. Casy Tibbs attended the ground breaking for the Cowboy Memorial and Library in Walker Basin Ca. In 1983 I believe. I need info and pictures of the Cowboy Memorial of anyone could help. I really enjoyed reading back through this thread. There were a lot of people on the forum then and it was always interesting. SADLY I can't help with Casey Tibbs info. My dad loved to watch him dismount on his feet and hand the hack rein to the pickup guys. I'm not sure of the name of it, but there is a Casey Tibbs and SD Rodeo museum in Ft. Pierre. Frustrated that the name escapes me and the Pierre phone book is in the car and I'm not dressed to go out and get it right now. It is a state of the art facility, with interactive displays and such. Beautiful location overlooking Pierre and Ft. Pierre, the Missouri and Bad Rivers, and such with 360% views. There is soon to be released a new movie about Casey Tibbs life. A young man, Justin Koehler, who grew up on a neighboring ranch to us learned about Casey several years ago and was fascinated with his story and has done very in depth research and I think it will be out sometime this fall or winter. I will try to get it on here when I have more solid information. Justin also made a movie of the life of Scotty Philip, The Man Who Saved The Buffalo a few years ago. It is a good movie about a very complicated man who was far more than 'just a cowboy' in the early days in this area. Many believe that had he lived beyond age 53 (think that's right, in any case, he died very early of a heart problem) he would have gone at least through the highest offices of SD politics, and was statesman material, rather than being just a politician.